The warm water therapy pool is designed for people of all ages to carry out a doctor's therapy and rehabilitation recommendations, counter the effects of such diseases as arthritis, and in general benefit from the therapeutic value of warmer water. Because the ambient temperature and humidity level are much greater than a traditional indoor pool and because the pool's purpose is for specialized exercise every person must have a release signed by their doctor on file at the Human Services Center before using the pool. Obtain a form at the front desk. Anyone under the age of 18 must be accompanied by an adult. No diving is permitted anywhere in the Therapy Pool. Any person with an obvious infectious wound shall not be permitted to use the Therapy Pool. No person who is observed passing feces, urine, or blood into the Therapy Pool may not be permitted to use the pool. Any person who has been refused entry to or removed from the Therapy Pool because of an infectious wound may be granted entry upon presentation of a written statement from a physician that the condition is not infectious. Patrons are not permitted to hang on steps, lane lines, or safety lines. Please use the handrails along the pool walls. Glass and other sharp objects are not permitted. Space for observers is located in the hallway and Activity Room F adjacent to the Therapy Pool when Activity Room F is not otherwise occupied. All accidents, incidents, or discipline problems should be reported immediately to a lifeguard. Please follow all rules and the lifeguards’ instructions. Locker Rooms in the Therapy Pool are for the exclusive use of individuals using the Therapy Pool. Private changing rooms are available for use of patrons who need them. Patrons and guests are encouraged to bring their own locks. Locker space is limited. Use of permanent locks is prohibited. Any locks left on overnight will be cut off. Patrons must provide their own towels. Electric hair dryers and swim suit spinners are available for patron use. Suit spinners are for the use of adults only. Only one swim suit may be placed in the suit spinner at a time. Suit spinners may not be used for anything other than swim suits. Please use caution and read all directions before use. 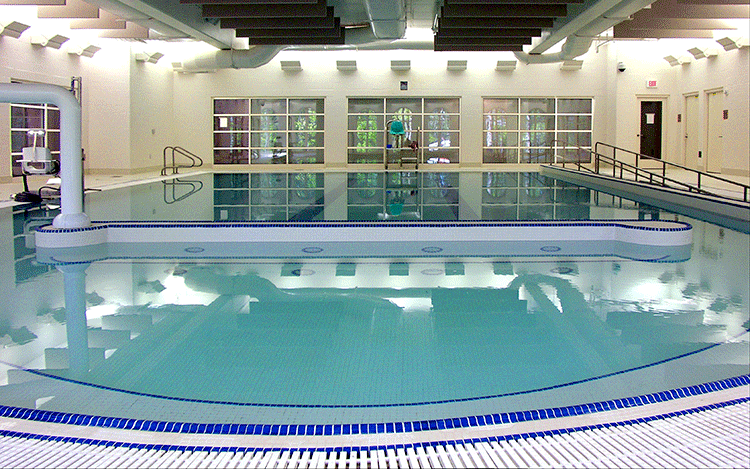 Telephones located in the Locker Rooms and the Therapy Pool deck are for emergency use only. Anyone needing assistance in the locker rooms must provide an aide or family member to assist them.